"Easily reached by plane, bus and train, it's surprising that more people don't choose to spend more than the absolute minimum in Qui Nhon and the province of Binh Dinh. It has a noteworthy beach in its own right, without any of the hustle or crowds. The government is revamping the city as part of a big push for tourism and interesting changes are underway. When it comes to the beachfront, the metamorphosis looks promising." 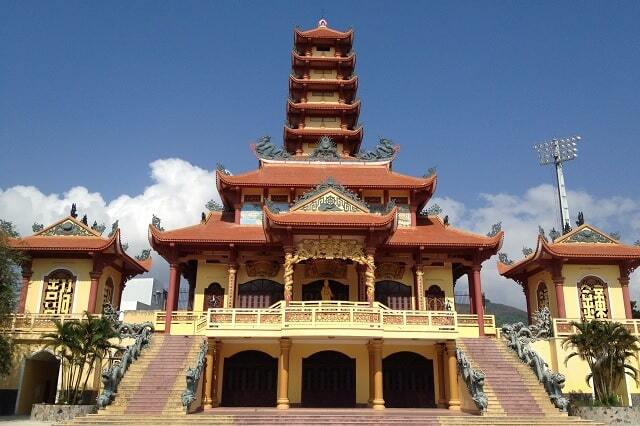 The Long Khanh Pagoda - was founded in 1700 by a Chinese merchant, Duc Son (1679-1741). He lived under the reign of Emperor Le Hy Tong (1676-1705). During that time, Buddhism was preached there. It is the main pagoda Qui Nhon. A 17 meter high Buddha (built in 1972) is visible from the street, near a pond with lilies. To the left of the main building is a low tower with a giant drum; on the right is his twin brother and it contains a huge bell, which was donated in 1970. Long Khanh Pagoda is located in the centre of town. It is one of the largest Buddhist centres of the province Binh Dinh. It is the place where Buddhist monks are worshipping and it's one of the tourist attractions of Quy Nhon. The architecture construction of the original temple is no longer available. The temple is now basically rebuilt in 1956 and completed in 1972. The architectural style of the pagoda style carries the Southern Chinese. About the value of architecture, Long Khanh Pagoda has nothing unique, but with history of formation and development of Quy Nhon, Long Khanh Pagoda has a very special position. The monks who reside here, preside on the religious affairs of active Buddhist community of the city. Mosaic dragons with manes of broken glass lead up to the main building, flanked by towers, a giant drum (left) and a huge bell. Inside, the large copper Thich Ca Buddha (with its multicolored neon halo) and a drawing of the Chuan (the Goddess of Mercy. The many arms and eyes of the Goddess symbolize touching her power everything and see everything. Long Khanh Pagoda was built by Duc Son, a Chinese merchant. This pagoda was restored several times in the past. The bronze bell was cast in 1739 (Ky Mui years). In 1954, the pagoda was severely damaged by the war with the French colonists. In 1957 there was again a major restoration of the pagoda took place, which lasted 20 years. The statue of Amitabha Buddha (17m high) on the front of the site of the pagoda was founded in 1972. Today it owns the pagoda still two valuable objects from the reign of Emperor Gia Long: Thai Binh Hong Chung (Hong Thai bell ) cast in 1805 and a seal engraved with the words "Long Khanh Tu" in 1813. The original architecture of the temple no longer exists. The present was now basically rebuilt in 1956 and completed in 1972. This architecture resembles the architectural style pagoda in Southern China.